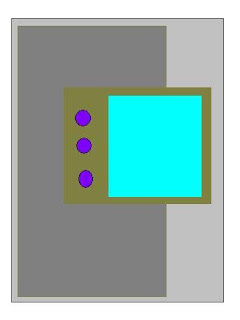 Another Monday....Another sketch challenge from MJ at TechnoStamper. For this sketch I've eliminated the small circles and used ribbon in it's place. My card has more of a distress look to it and I wanted the ribbon to have that same look. After dying my white taffeta ribbon with my soft sky ink, I used my chocolate chip marker and ran it just along the edge, then swiped it with my aquapainter to let the chocolate ink bleed a bit into the soft sky - I love the way the ribbon turned out. 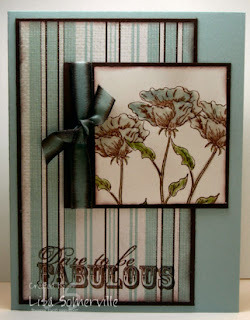 My flower images are from Bloomin' Beautiful, stamped in basic brown. I morphed the Embossed Watercolor Crayon Technique (TJNL), as Stampin' Up! doesn't' carry Soft Sky in a watercolor crayon - so I used my aquapainter and ink pad for color, then clear embossed. The ribbon looks super! Very pretty. The whole card is just gorgeous. I love the flowers embossed it just makes them pop. Thanks so much for playing again Lisa. Very pretty Lisa! I love those colors together. Super pretty, Lisa! I love the ribbon--great idea! This card is wonderful, I love those colors together and that ribbon is Gorgeous!!! Exquisite!! Great job on the ribbon.